Autumnal Yoga Supper - Reviewed in Draze magazine! 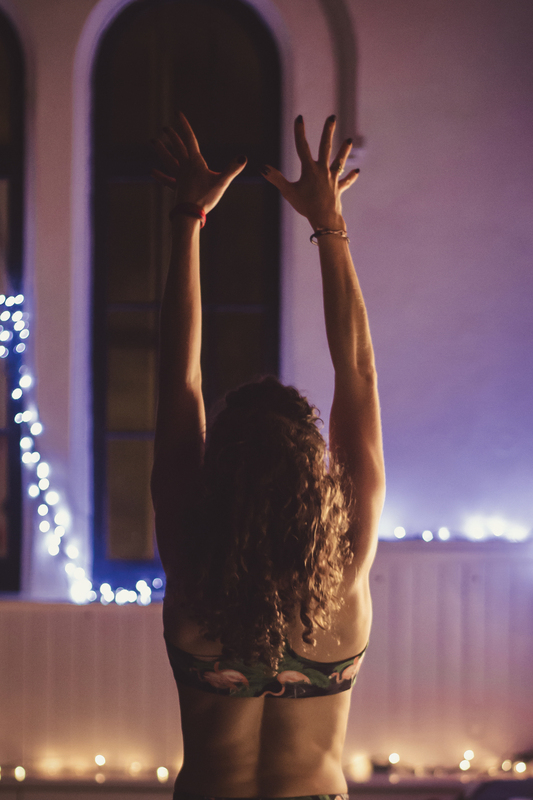 On a cold Friday night in November, friends, family and yogi enthusiasts alike gathered to the beautiful Round Chapel in Hackney for an evening of uplifting yoga and delicious food and drink. On arrival they were greeted with a complimentary hot cup of Positivitea, and a sea salt, cacao and mulberry wild bar before finding their place on a mat. Amongst the candle lit setting I took them through 75 minutes of Rocket yoga, followed by a well-earned savasana and an essential-oil head massage. After a post yoga tipple of mulled apple Bellini, guests made their way to the banquet tables to settle down to a three course gluten-free, dairy-free and refined sugar-free feast. All the food was made by Mim McCulloch, founder of Wild Thyme Food, which specialises in plant and fish based seasonal, free from foods. Dinner started with golden, candy and red beetroot, fresh goat’s curd, basil pesto and baby salad leaves, followed by Greek gigantes beans, garlic portobello mushroom, cavolo nero and a Manchego crisp, finishing with an indulgent but guilt free dessert of ginger parkin with sticky date sauce, poached pink pear, candied pecans, coconut cream and fresh mint. As a parting gift each guest took home a goody-bag full of yogi treats from Propercorn, Pip&Nut, Savse Juices, Neal’s Yard Remedies, Vitacoco, Nutty Cacao, Positivitea and of course a copy of Draze! The evening attracted 30 guests and every ticket included a donation to Magic Breakfast charity which provided 8 healthy breakfasts to children arriving at school hungry in London.